Once an idea got clicked in the mind of Mr Ketan Vekariya that is to provide recognition to MSME and entrepreneur who are applying for Best MSME or Entrepreneur awards but not getting this title though, they are delivering their best quality outcome but because of terms and conditions of award provider to give awards to counted numbers of nominees. To overcome the above said, he want to start new concept, so they started thinking deliberately on this idea, the new concept and started analysis work, hence doing research on concept of India 5000. First step was taken for this concept, registration of concept related to offline and online medium were done, which was, domain booking for India 5000.
Business development work analysis, Methodology of India 5000 concept and setting eligibility criteria for nomination. Brain storming was done here to set milestones via Business development work analysis, Methodology of India 5000 concept and setting eligibility criteria for nomination. After doing in-depth requirement analysis, he has set milestone and start analysis of other segment of India 5000 concept. In this phase, he did analysis of web related task. It may be of web design and development, other design related stuff and web content work. After doing brain storming for all requirement and India 5000 research, he developed rough business plan. Journey of logo work started, after doing research and analysis for more than 1 year. After working on several concepts and variations, in December 2015 the logo was finalized. Website which worked as medium for client communication, prime focus was given for this work. India 5000’s website work was started by Aisomex Consultancy Services Pvt. Ltd.. Web content writing work was started, as Mr Vekariya want to give importance to India 5000’s web content also. On other side, India 5000 has started In-house and Outsource graphics work. With this he has started Social Media Marketing related work with the help of his in house content writer. India 5000’s concept phase came where team of BDE were required so one another segment of work was needed to start, that is, recruitment procedure of India 5000 BDE team, next task in content work was to start the story writing work completion, Milestone cleared was, Award trophy design and demo trophy task completion. 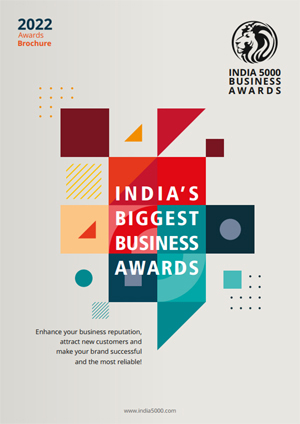 First segment of India 5000’s concept started in 2015, get updated in June 2016 by a new concept and as per analysis new logo designed for India 5000, as well on other side India 5000 award certificate design work was also done. In the direction of recruitment, candidate selection related shortlisting were done; in which Interview can be next phase to hire great talent for India 5000. In December 2016, First list of India 5000 title achievers names were get listed at our webstie. India 5000 courier them award kits. Due to demonitization effects India 5000 postponed that award celebration program. First ever ceremony held at Rajkot, Platinum Hotel. India 5000 organized award ceremony function, recognize award winner with award kit given by our hon'ble guests. India 5000 Award ceremony held at Pramukh Swami Auditorium. Award winners get their honor from our hon'ble guest and also India 5000 conference was introduced for award winners.